Durable, easy to use carry-ons that are expandable. 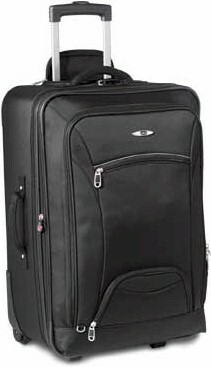 One of Skyway's more durable collections, these carry-ons have state-of-the-art suiters that provide wrinkle free packing. The smooth rolling wheels and lightweight construction are great for travel. And both come with a removable, hang able waterproof toiletry kit. On the Outside These cases are constructed out of ultra durable water and tear resistant Micro-Ballistic nylon material. In Line Skate Wheel System is designed for smooth operation and long life. Corner mounted wheel housings add an additional level of protection. A pair of exterior pockets keeps important items within easy reach. All these features found throughout the Skyway Flair 5 collection. On the Inside The interior is fully lined with 150-denier polyester and is complete with a toiletry kit and elastic tie down straps to keep packed items secure during transit.